Looking for something new in the water? 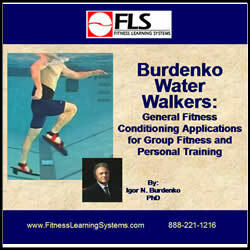 The Burdenko water walking program is just what you need for group, personal training, or rehab. This program based on the Burdenko Method contains unique exercises using the Burdenko water walker equipment. The program is different, functional, maximizes time efficiency, and makes exercising fun. It is easy to remember, and mimics some sports movements. Videos and text give clear instruction for each exercise. Your clients will love these unique exercises that can make up an entire workout, or be mixed with other more traditional exercises.